community members, entrepreneurs and home-based businesses. Increase your exposure in the community and provide strong advocacy, economic and community leadership and build connections. Please note the office will be closed on all statutory holidays. Maps and community guides are available in the slot at our front door. See our Events Calendar for upcoming events. ipe parade applications now available...and I'm not horsin' around!! We would like to thank the following businesses for committing to sponsor our community events. ​We have room for more if anyone is interested! ​You can contact us for more information. Melanie Anderson from Full Circle Memory Beads. Contact her to create your own special beads. Devin Felker from Beacon Electric has 10 years of electrical experience to help you with your electrical needs. Make sure to check out Road Conditions as you plan your trip. ​For wildfire updates, check out this interactive map. We always knew we were awesome and now everyone else can know too! Check out one of the best places in Canada...Armstrong Spallumcheen!! Visit Armstrong Spallumcheen's profile on Pinterest. Location: 2526 Pleasant Valley Blvd. ​​Staff are welcome to attend. Refreshments are provided. 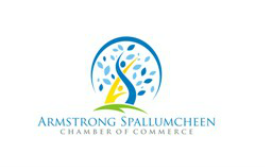 No charge for Armstrong Spallumcheen Chamber of Commerce members. Bring your business card to be entered to win the door prize! Interested in hosting a BAB event in 2019? Contact﻿ our office and you will be placed on a waiting list!